A type of food consisting of small chunks of meat, poultry, or fish combined with vegetables which are placed onto skewers or grilling baskets and then grilled or broiled. 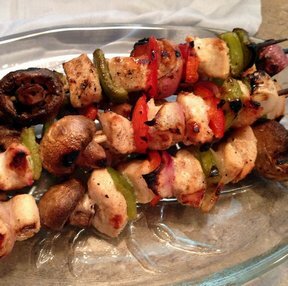 Several Turkish words were the origin of the term Shish Kabob, using the word "sis" meaning skewer and "kebap" meaning roasted meat to create the term that is commonly used to refer to this food dish. The two words are often shortened to only Kabob or Kebab when referreing to this preparation of skewered meat. 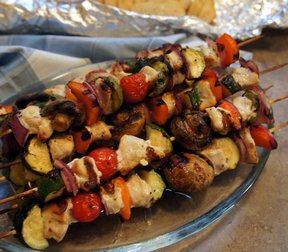 The meat for the Shish Kebob may be marinated prior to cooking and then pushed onto the skewers or placed into the grill basket, alternating the cubes of meat with pieces of vegetables, such as bell peppers, onions, mushrooms, and tomatoes.